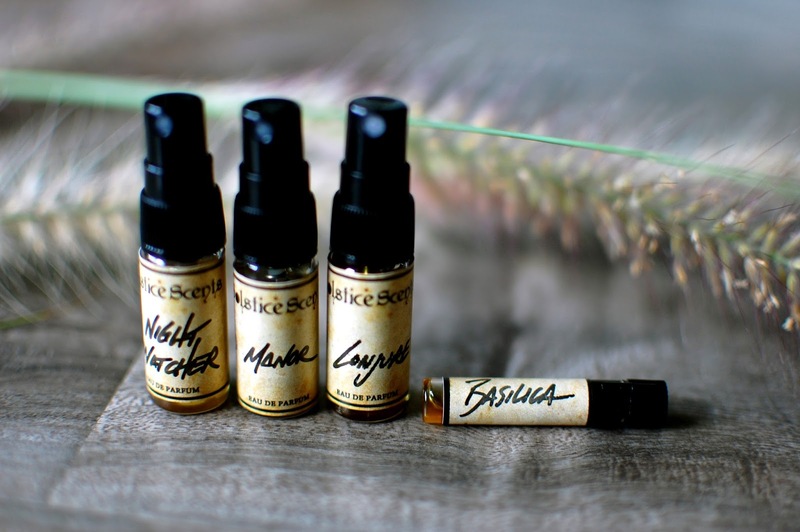 Solstice Scents creates and carries some amazing perfume oils, bath and body care products. Solstice Scents is based out of Gainesville, Florida, which makes them even more dear to my heart. They even carry a Devil's Millhopper scent, getting its namesake from a beautiful if haunting sinkhole that I visited before I graduated the University of Florida. 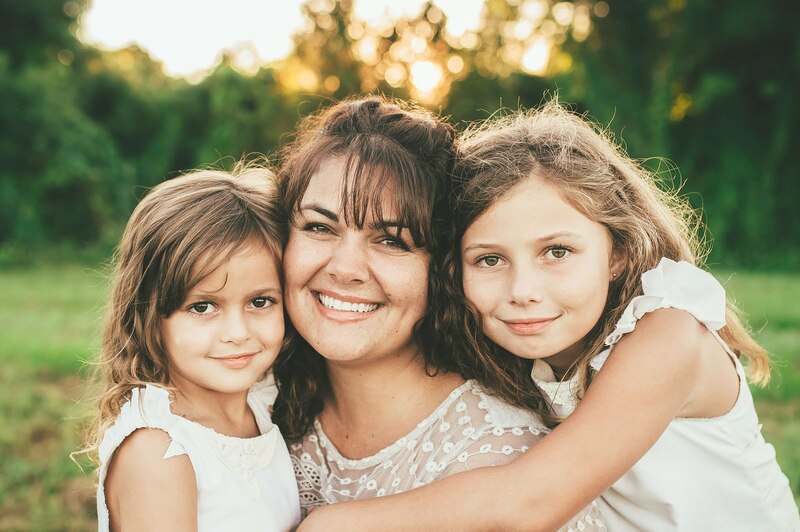 Angela has been diligently working to create an Eau de Parfum formula for a good long stretch of time and finally rolled out the new perfumes last weekend. The 3.3 ml sample sizes ran about $8.75 each for most and $10.00 for a couple extra special house blends. The full bottles of 60 ml start at $70.00. My order shipped quickly and came packaged beautifully as usual. I love the cards with scent descriptions and the bookmark. With every order you can request a perfume oil sample of your choice. I asked for Basilica. I fell in love with it when Lynda gave me a vial several months back. Night Watcher- Notes Include: Forest floor, tree tops, fir, moss, bark, balsam, juniper, cedar tips, dried herbs, oud, mountain air. A creature of the night sleeps in a hollowed log, full of earth and soft leaves. As the fragrance dries down the creature emerges from the soil and old wood, shaking them off, to greet the night. Aromatic herbs, grasses and cedar swirl in the moonlight and cling to the nostrils. The final fragrance to linger is a soft vanilla musk. The sillage is soft to moderate with a longevity of about 4 hours before becoming a vanilla musk skin scent that needs to be cuddled to detect. Beautiful experience. Manor- Notes Include: Vanilla musk, vanilla, agarwood (oud). Beautifully constructed vanilla woods aroma that is less sweet and more mature than Vanille du Bois. It brings to mind the boudoir in a neglected ruined mansion. The faded pink velvet and crumbling rose patterned silks still hold their mistress' vanilla laden perfumes. The wooden furniture has begun to rot and moulder, wafting a richness into the sweet air. This is a cult classic for Solstice Scents and I can see why. I would buy this in place of my Serge Lutens Vanille du Bois any day. Less candy, more dark woods. The sillage is soft to moderate and the longevity is about 5 hours or so until it stays pressed to the wrist and no longer trails behind. Conjure- Notes Include: Vanilla, amber, cedar, spices, and cauldron smoke. The notes do not list it as such, but it reminds me of a spiced incense aroma. I imagine it does smell like a sorcerer's apothecary shop. Resiny sweet with a touch a green from the cedar and something brewing in the backroom for a customer, its smokey tendrils curling into the tiny old shop from behind a cracked and peeling door. This is what I want to smell like in deep fall. On Halloween. Or while reading a mysterious book. The sillage is moderate and the longevity is about four or five hours. Magically evocative. Conjure's spray vial did not want to work initially but a forceful pump clicked it into place and got it going. My experience with these beauties has been so overwhelmingly positive, that I ordered two more to try: Black Forest and Hidden Lodge, with a sample in Tenebrous Mist. I keep eyeing Library and White Fox as well. A full bottle of Manor is calling to me. I hope hope hope she decides to create Basilica into an EDP as well some day. Have you tried Solstice Scents? What are your favorite scents from them? Do any of these spark your interest? I was wondering how these would compare to the other alcohol perfumes you use, since you have a lot more perfume experience than I do. I always thought of her perfumes as pretty strong but that may be dependent on amount sprayed...perhaps stating the obvious, haha. ;) Looking forward to hearing about the next batch! The chocolate one on your list took me by surprise, that is a compliment to Angela! I applied some Midnight Oil, still yum. I hope you try that one too! I use my concentrated Dior Pouson and parfum strength Sonoma Scent Studios as my barometer of a large sillage scent. These guys can knock people out in a 100 foot radius if I am not careful with application. And I tend to be heavy handed. I like to spray with abandon. These are very nice scents!